One facet of advisor value is the ability to pick money managers that provide above-average returns. One facet of advisor value is the ability to pick money managers that provide above-average returns. Choices are vast, which creates dispersion between top and bottom performers. 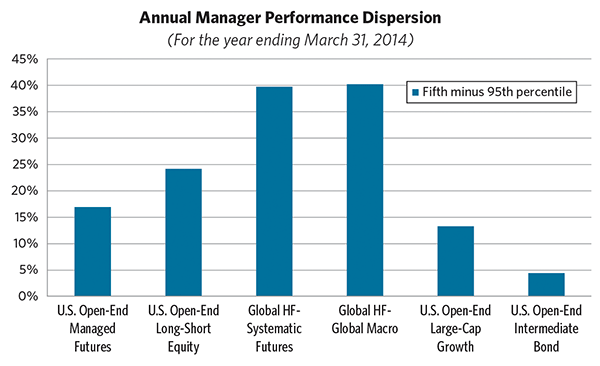 High dispersion increases the opportunity for advisors to add or subtract value from manager selection. Many advisors spend a great deal of time performing analysis and due diligence on the investment strategies and managers utilized in their clients’ portfolios. Since allocations to traditional long-only strategies typically represent the vast majority of a portfolio, the time and resources committed to their due diligence is commensurate. However, the dispersion between top and bottom performing long-only managers is normally much less than that witnessed in many alternative investment categories. This concept is not new to those who have experience with venture capital and private equity funds, but is still being discovered by advisors who are adopting liquid hedge fund strategies. For example, for the five years ending March 31, the difference between top and bottom quartile large-cap growth mutual funds was 2.87% per year and 2.72% for intermediate bond funds, according to Morningstar. By contrast, the differences between top and bottom quartile long-short equity and managed futures mutual funds were 7.50% and 6.21% per year, respectively. As we all know, an extra few percentage points of performance over only a five-year period can add up to hundreds of thousands of dollars on a million-dollar portfolio. While the five-year figures above are eye-opening, this dispersion anomaly is exacerbated when looking at the extremes, shorter time periods and institutional hedge fund managers. The latter point is important as more and more institutional hedge fund managers move into the mutual fund space. Expanding the ranges to the top and bottom 5% of managers increases the dispersion to roughly 7% per year (over the same five-year period) for traditional large-cap growth and intermediate term bond funds. By comparison, the dispersion becomes massive at 19.80% and 15.12% per year, respectively, for long-short equity and managed futures mutual funds. The chart above represents return dispersion over the latest 12-month period ending March 31. It provides an opportunity to view the tremendous dispersion possible over shorter time periods. It also illustrates the potential for outsized returns from hedge fund managers. Over this latest 12-month period, the dispersion from the top to the bottom fifth percentile was over 24% for long-short equity mutual funds, but only 13% for long-only large-cap growth. The dispersion for intermediate bond funds was minimal, indicating much less opportunity to add value from manager selection. It’s also clear from this illustration that hedge fund manager dispersion can be enormous. The data is indicative of the opportunity for advisors to provide more value from manager or product selection in the alternative investment portion of portfolios. Most traditional strategies are crowded and competitive, which results in little difference between the best and worst funds. Alternative strategies, on the other hand, are much less constrained and efficient. Advisors who want to differentiate themselves from their competitors should consider shifting resources to these less efficient areas where the opportunity to improve client returns are more prevalent.